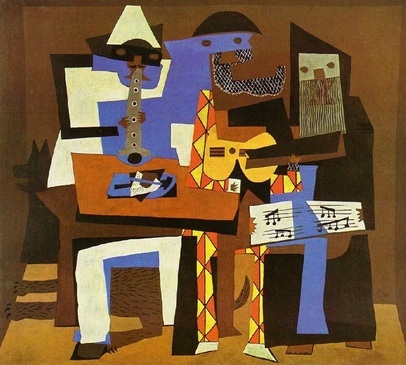 ​Pablo Picasso, born in Spain, was known as an artist who invented new methods and styles of art. 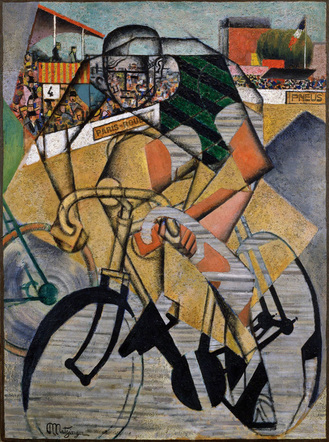 He is credited with being a founder or an important part of multiple new styles of art, such as Cubism and collage art. Unlike many artists, he achieved fame and even fortune within his lifetime. 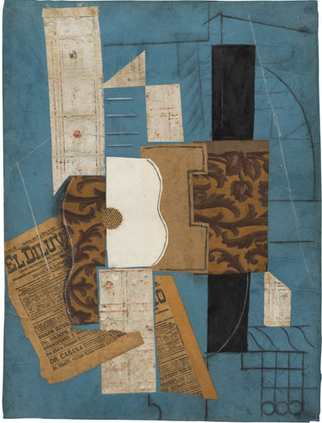 Our artwork of the week is Picasso's collage, Bottle of Vieux Marc, Glass, Guitar, and Newspaper. 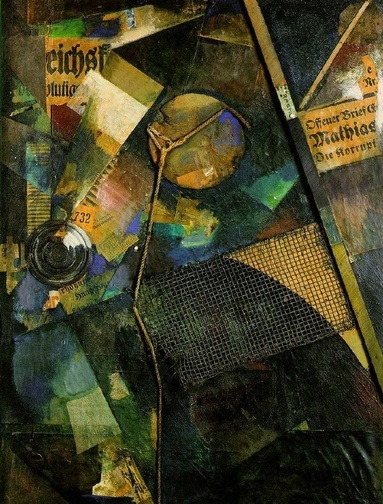 Collage is an artwork made up of assorted materials glued to a paper, board, or canvas. 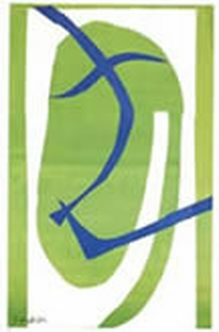 The materials used are determined by the artist. Some collages have included newspaper clippings, photographs, pieces of fabric, and solid objects among many other things. 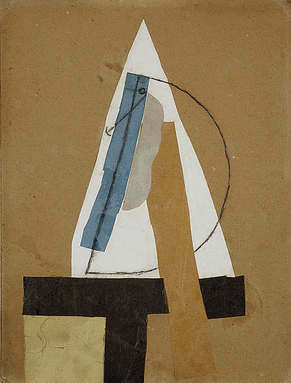 Pablo Picasso and Georges Braque were the first to use collage as a method for creating innovative art. They came up with the name "collage" from the French verb "coller" which means "to glue" or "to stick". 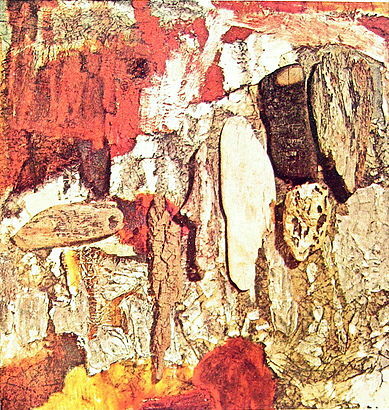 Collage revolutionized modern art. Our artwork of the week, Bottle of Vieux Marc, Glass, Guitar, and Newspaper, is created from printed papers and ink on paper. 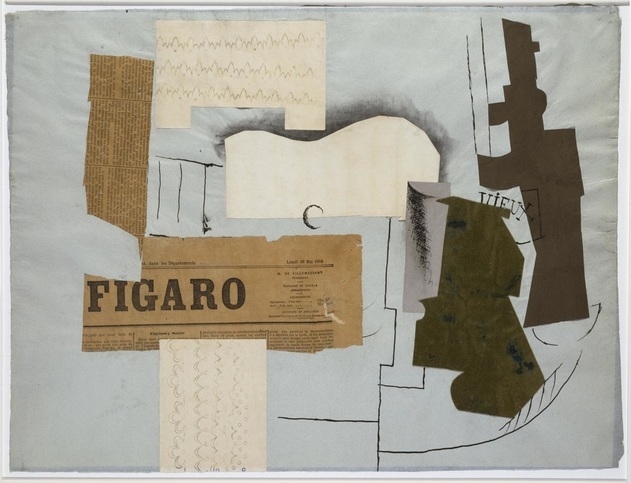 The newspaper clipping was already thirty years old when Picasso chose it for his collage, so perhaps he wanted it to have a yellowed appearance. 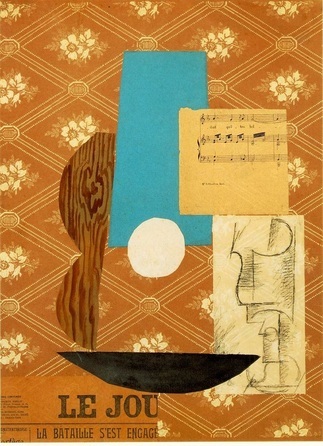 Picasso’s early collages often used wallpapers and newspapers. 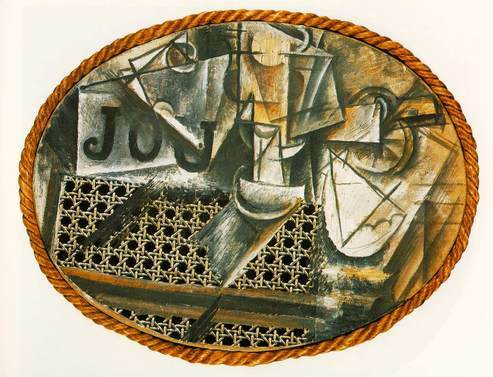 For his 1912 collage, Still Life With Chair Caning, he glued oil cloth printed with a chair-cane pattern to the surface, added newspaper, and glued a piece of rope around the oval canvas. This artwork combines oil painting and collage. 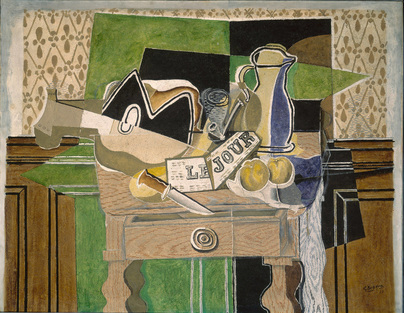 Collages are not always flat such as Picasso’s Bottle of Vieux Marc, Glass, Guitar, and Newspaper or Matisse’s cut-out paper collages. 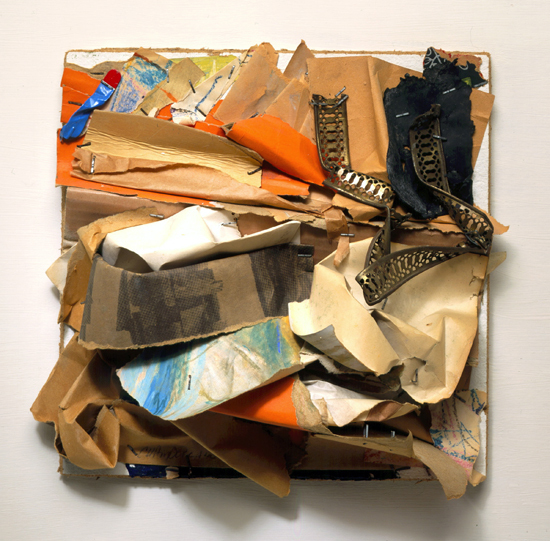 Relief collages use three-dimensional objects that are glued, nailed, stapled, or sewn to a flat base such as a board. Wood-relief collages create art by arranging pieces of wood or wood shavings and scraps to a canvas or board. Relief collages can be made out of anything. 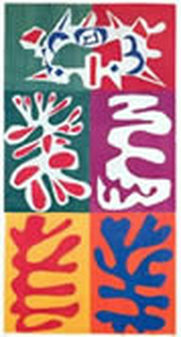 Megan Hovany mades relief collages out of cardboard, such as this mural for the Chicago Children’s Museum. Collage made from photographs, or parts of photographs, is called photomontage. 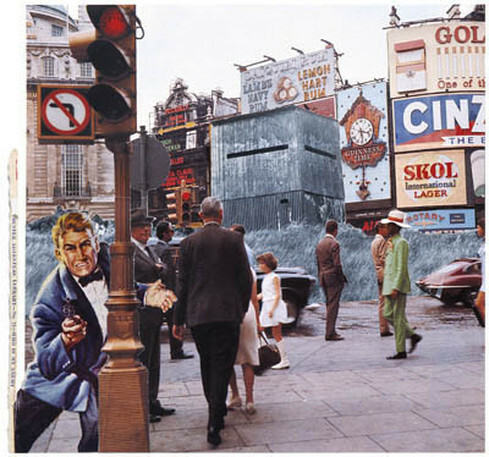 A photomontage combines photos to make one. 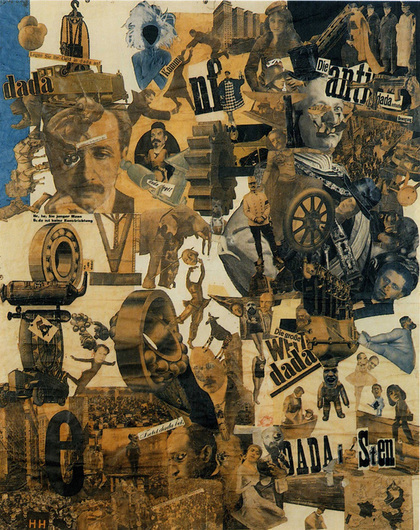 An art movement in Germany known as Dada used photomontage to protest during World War I.
Dada artists used collage to produce sometimes bizarre art. 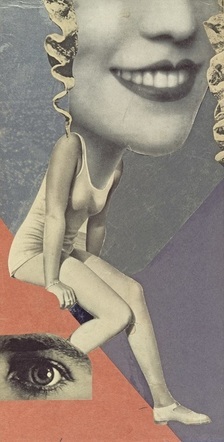 Photomontage was used by by Surrealists and Pop artists. 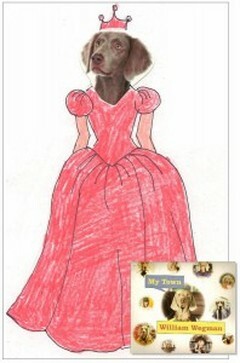 This photomontage was done by Mrs. Hurdle. 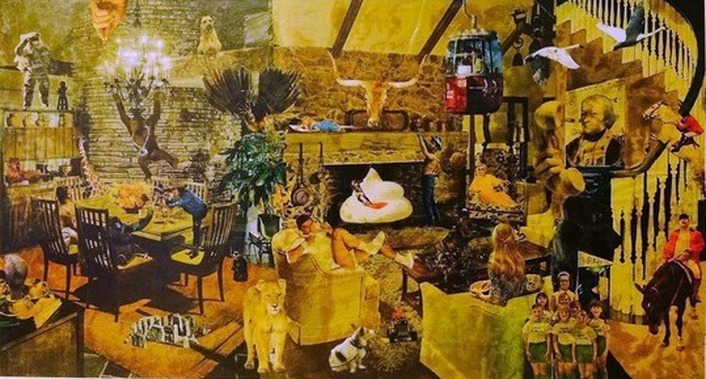 It combines photos from magazines to create one busy, bizarre room. This collage combines photos with drawing. All kinds of possibilities exist for an artist using this method. Edhelper.com,. 'What Is A Collage?'. N. p., 2015. Web. 2 Nov. 2015. Encyclopedia Britannica,. 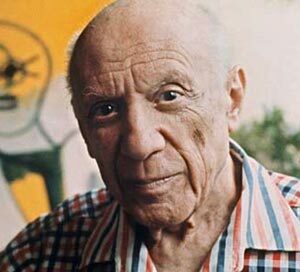 'Pablo Picasso | Biography - Spanish Artist'. N. p., 2015. Web. 30 Oct. 2015. Gersh-Nesic,. 'Art History Definition: Collage'. About.com Education. N. p., 2015. Web. 30 Oct. 2015. National Gallery of Art, DC. 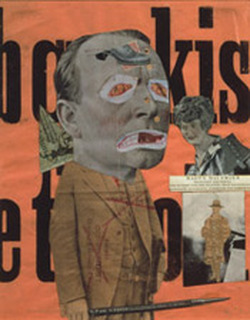 'DADA - Techniques-Photomontage'. Nga.gov. N. p., 2015. Web. 2 Nov. 2015. 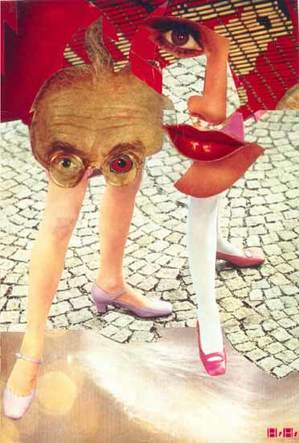 Top 10 Collage Artists: Hannah Höch To Man Ray'. AnOther. N. p., 2014. Web. 30 Oct. 2015. Wallach, Lauren. 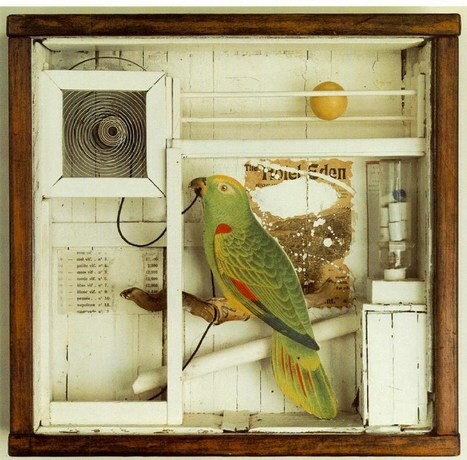 'Art 101: A Cut-Down History Of Collage | Artspace'. Artspace. N. p., 2012. Web. 30 Oct. 2015. Wikipedia,. 'Collage'. N. p., 2015. Web. 2 Nov. 2015. Wikipedia,. 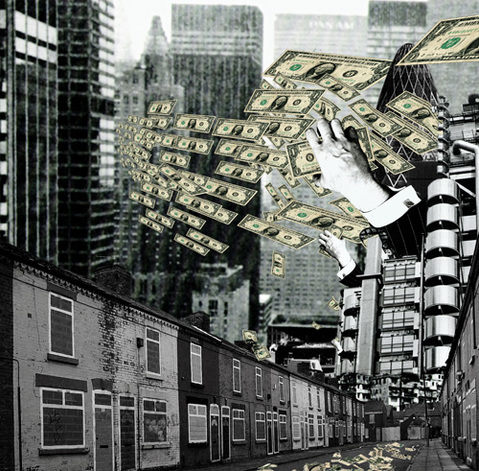 'Photomontage'. N. p., 2015. Web. 2 Nov. 2015.